You would see a pie chart like below when logged into your Q. 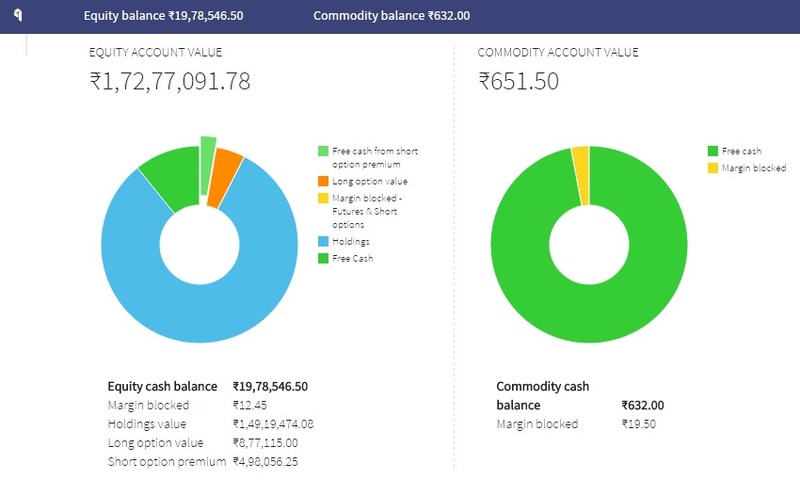 The chart gives you a quick overview of the value of your equity and commodity accounts with us. The following should help in better understanding how to use this chart. This shows the total cash present in your trading account. The cash which can be used to take any new positions. This is the total margin (SPAN + exposure) blocked for all your futures and short options positions. The total value of all your demat/stock holdings as per the previous closing price. The total value of all your long options premium as per the previous closing price. When you short/write options, the premium gets credited to your trading account on the next day. This premium is technically not yours unless it expires at zero. So until expiry day, this option premium should be deducted from your equity cash balance to know your true cash balance. Assume your Equity cash balance is Rs 105,000 and you have shorted 100 Nifty calls a few days back and the previous closing price is Rs 50. This Rs 5000 (100 x 50), is the premium present in your account which if squared off at Rs 50 will be debited and given to the option buyer. Hence your true account balance is not Rs 1.05 lakhs, but Rs 1 lakh ( 105,000 – 5,000). Free cash from short options is the money lying with you, but still doesn’t belong to you. Hence it is depicted by a light green piece on the pie chart sticking out to show that it doesn’t really belong to you. The big number at the top shows the total value of your account if you were to liquidate/exit all your holdings and open positions at the previous closing price. The chart works very similar with your commodity account as well. Since there is only futures trading, your commodity account value = Cash balance + Margin blocked for futures. Note that updates on Q are currently not on a real-time basis. Q gets updated at the end of everyday after trade process (around 7 PM). So your pie chart will also get updated only then. The idea behind the pie chart on Q is to intuitively give a quick overview of your account with us. GREAT JOB. THANKS. WANT BRACKET ORDER QUICKLY. please do needful as urgent basis. I have purchased shares but not showing anywhere positions or holdings. Have you sent the physical PoA? No Shankar, we’ll get the franking done on our end. Yep, tough job to include pledge stocks into this as the margin from the pledged stocks gets credited to your cash balance. But let me figure something out for that. please support your pi releted .every time calling but not support good.also your custmer support language problem.better advice hindi option also.semi algo not working .pls listen my problem and solved.i hope very shortly solved problem and co -operate . Most of our executives are multilingual with proficiency in English, Kannada and Hindi. We’ll get someone to speak to you and help out with Pi. 1) what cash balance is available for purchasing stocks/options. 2) Cash margin to be used over and above 1) for margin and used only against long option positions, long stocks. Got it, let me sit with the guys and plan something out. depending where nifty expires in FO sections. Yes, I think this is a valuable educational resource for trading commodity. Although this is not the place to point this out, but there have been a few bugs with the Z5 – HTML version of the site, for which I have been following up with the Zerodha support for over a month now. The log out and one-click square off functionality has not been working for a long time now..
Muthu, will have someone check this. Z5 is a vendor product, built by Omnesys/Thomson Reuters. Btw, our in house web based trading tool Kite, is due for release in the next few weeks. today i log in to Q and cant find holding value on pie chart and when i click on holding it say no holding ..why this happening sir. Bipin, We had some issues with our server yesterday night. Got fixed early morning today. today i check and it show holding but my buy avg price is showing wrong figure . Pi Access is not activated even after 3 days after placing request. Can you please activate the same. NEST is not working in my system. You had requested on Friday night, it will be enabled by end of day today. Is currency market trading on Saturday. This is Thiru, i have been using “NSE Mobile” app in my mobile, previously update order was working, but it is not working now. If one needs to alter their order he/she has to cancel that order first and then initiate new order for the altered price or quantity. Alter order is not working in NSE Mobile. Is this restricted in exchange itself or it is a bug in nse mobile app…? please do something to fix this issue. First of all i really appreciate that you are active answering all queries here ..thats great . I am a new user of Zerodha and mostly I prefer the web version which is really pathetic. As far as Z5 is concerned, that too is not very impressive as compared to the interfaces i have experienced in past . 1. I can not use it in office as people notice it from very far. If there could be an option to change the background that would really help. 2. To sell stocks in BTST mode there is no simple way ..it doesn’t show the profi/loss in same window . 3. Even if i use the Z5 , it logs me off frequently which is very annoying . 4. The initial login process is long …we have answer many questions etc… that could be avoided . 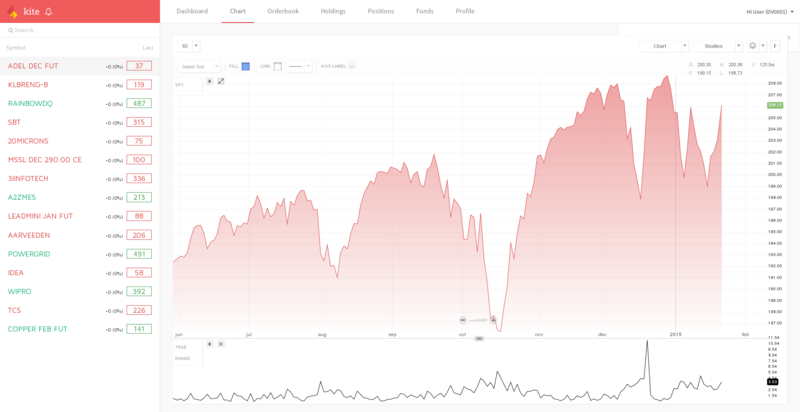 I have been using icicidirect for last 10 years and never had any issue with any thing …their interface and user friendliness is awesome …I know the brokerage is less but i guess the trade off is to have less usable interface and other problems. I am still very skeptical about my my future relatioship with Zerodha . I hope there will be a better experience in future . Check this on Varsity. We have a complete module on Futures trading, explains how it actually works. I wish it was true! Can someone acknowledge this bug or am I missing something? Elegant, are you still seeing this? It was fixed immediately. Can you do a ctrl+refresh of your webpage. Thanks Nithin for the reply. I’m sorry I could not check this until today. However, its even worse today, as I’m unable to see any of my positions, neither does filtering by Stock code work. :(. I did a Ctrl + Refresh, I tried clearing cookies, I tried a different browser and the incognito mode, nothing works. Screenshot’ed here. I agree data migrations happen, but wiping out the entire positions (on display) to make your data migration happen? Is this for real? I’m myself a lead developer with one of the giants in retail brokerage and if this were to happen at my firm, we would have been hit with a zillion lawsuits by now! I’m seriously at a loss of words to understand this. I think you need to sit down with your tech folks and haul them up. I’m sure its not the first time the tech group has messed with something. I totally understand things can go wrong in tech world, but these minor irritants can be troubling. I login, usually once a week and when I do not have my holdings info readily avail, the only chance I have for the week is lost. If you think from my shoes, you will get it. Yes, no excuses for this. We are having issues at our data center, and this causing delay in uploading the holding files. You will be able to see the holdings in a little while from now. The issue should be sorted out in the next couple of days. Sorry about any inconvenience caused. Thanks Nithin for the response. I appreciate you owning up and also for the responses late in the night. I’m able to see my holdings now. I do face this issue constantly . Some time one or the other holding will be missing. What is happening with Q ? I cant just rely on Q to see my holding . To be sure i have made a Moneycontrol account to track holding and a excel . I have already written to Anuba from your team who fixed the issue on 24th March. Now same problem with the stock i bought on 30th March .Do you say i should keep track of stocks in two to three places ? For the past 1 week, i observe accessing issue with q.zerodha.com, i tried all posisble ways through my desktop, mobile…and gives error. any maintenance work is going on? It is working now, but yes some issues with our data center last few days. well, it’s not. I’ve no idea what is my positions. The Q doesn’t work nor I see the positions in the Pi as what price I’m long or short…..
very difficult to find out how do I take profit or exit by taking loss. Is there any issue with Q.ZERODHA.COM? I am unable to access from US from past couple of days. It is difficult to track the positions/transfer back money to bank account without this? Also, When we transfer shares from other broker to zerodha, buy value keep getting overwritten to zero in holdings statement. I tried updating many times. But by next day, it is zero again. This generates incorrect P&L statements and short/long term capital gain statements. Yes some issue accessing from outside India. We will have this fixed in the next couple of days. About buy value getting overwritten, will have this checked today. On a lighter note, Don’t do too much branding/advertisement with ZERO(dha) every where :D.
I have the same issue with Q. I am not able to access Q from Singapore over last few days. Kindly fix asap. Yes, give us one more day. I am new here. Just wanted to have a clear understanding what is Buy Avg Price in Q. Is it the per stock price excluding Brokerage ?If its is Excluding Brokerage price I think you are showing a wrong calculation of profit and loss of the holding . Even if you charge maximum 20 Rs as Brokerage ,there are charges like STT, Tran charge, Service tax Education cess, Higher Edu cess , SEBI charges and Stamp Duty which altogether more than 20. So don’t you feel there should be a need to include all these charges when you show the Avg Price ?I was using ICICI and finding it very handy to find my actual buy price which is Stock price+ inc of STT, Tran charge, Service tax Education cess, Higher Edu cess , SEBI charges and Stamp Duty. Please put your thoughts on this. Yes Vj, currently the buy average price doesn’t include the cost. And yes, we are working on showing you with the costs soon. Excellent….thanks you for the response .How soon we can expect it to be implemented ?Any time frame ? Hopefully we should have this in the next couple of months. can we make block orders in Pi? Basket orders are not allowed as of now. first i really appreciate zerodha .. its very good trading flat form with excellent Brokerage. so that it will help us to look at our holding how much our value is moving up or down .based on that we can buy more units to balance ..
3. when we buy additional shares to balance ,, again they are showing as separate transaction in report .. i feel it should add to the old purchased shares and show the average ..
4. Balance Margin should show in Z5 chart it self in some corner ,,rather we go back to the page and search to know the balance..
5. please start mutual funds and Corporate Bonds Option ..it will be really helpful .so that customer doesnt need to look at some other demat and trading accounts in the market . 1. Yes, it will start happening soon. 3. It will show separately only for 1 day(T1 holding), once the stock is delivered it gets added to your original holding. 4. Didn’t get, Z5 chart? I frequently facing problem while opening PI as well as while loging to it. face problems while opening and login to PI. Please give some solution at your earliest. Shouldn’t happen, btw we will have a new release in the next two days. Can you check if that issue persists after installing the latest version. At the moment we get options of 1-min and 1 hour in the technical charts. When will you introduce 5-min, 15-min and 30-min ? The scrip code is 533288 and the scrip id is CLARIS. Can you please explain the difference between “equity balance” and “equity cash balance” . Both are shown in BO. Equity cash balance is just the free cash, whereas equity balance includes all margins blocked for futures and options trades. If you are trading only equity, your equity and equity cash balance will be the same. I just saw an update in BO and wanted to give a feedback. You have introduced a breakup of stock for holding time.It is good move ,however i would be more happy if the Cost of the Stock price is also mentioned along with days. Secondly , days back i had asked if you have any plans to show the actual cost price of each share which is inclusive of brokerage,stt and other statutory fees. When can we expect to see this change ? Yes both are on our list VJ, hopefully soon. My equity account value is showing wrong, and if i look into my holdings i am getting an data error. i can see my T1&T2 holdings but some problem with the pledged holdings. Please fix this ASAP. My account shows a incorrect figure with related a stock..It is asking me to enter the buy price.However i have bouth it through Zerodha itself. Could you please check. I have attached the screenprint. VJ, best if you can send these directly to [email protected] with your client ID. you Q back office is really really bad , i never find correct figures of my holdings / balance ever , its time to time changing during off market too . Did you test you Q back office properly ? is there any way available to my holding and balance properly ? Would you be able to highlight the exact issues you’re facing? If you’re checking the holdings/balance during the time that we’re running the EOD processes, you may see the balances changing. Its best to check balances around 7:30 – 8:00 pm when both your holdings and funds are updated. If you’re still facing any issues, do send out an email to [email protected] with screenshots and we’ll have it fixed, if needed. Sometimes i want to check the total of my holdings account without a specific stock . but then i have to paste it in excel to do the entire calculation. Let me bounce it off the team. If there is no further loss, the position could be held till end of day. 1. I can not find Contract Notes in the Backoffice. 2. I do not see Actual Cost of the trades for the day included and shown accordingly in my Ledger. 3. All Calculations and Pie Charts are not showing accurate numbers. 4. I do not want to see margin/span entries etc. in my ledger. I just need plain numbers showing clear debit/credit enteries… i.e. how much deducted for what and how much credited for what..! 5. Why one contract note issued for many trades done for the day. I would like to know cost and net P&L for each and every trade done without mixing them all in one single contract note. 6. You must give a choice to your client either to use new backoffice (Q) software or any old traditional software for backoffice purpose. Do not over-use technology to make things complicated. Accounting is best left traditional and classical way as it has been. The purpose of Q is to give you better analysis of your trading where traditional backoffices’ fail. We believe it helps you understand yourself as a trader and make better informed decisions whilst trading. 1. We are in the process of integrating the Contract notes onto Q. You shall soon be able to see them on Q. Till such time, we’d request you to view the contract notes by accessing: bo.zerodha.com, the login details remain same. 2. You may check the cost of the trades either by accessing the P&L report or by checking the contract note. Please note that tradewise charges aren’t available because we don’t charge a percentage brokerage. 3. Please let us know where you’ve found discrepancies. We’ll have them fixed/explained to you. 4. Margin blocked provides information on how much is charged for the open positions you’ve carried forward. We believe its essential for a trader to know these margins and hence appear on the ledger. Also the debits and credits appear on ledger. 5. Exchanges have made it mandatory to provide common contract note: http://www.nseindia.com/content/circulars/INSP26233.pdf which is why you’re getting these. Note that we also send you segment wise contract notes to your email id. It seems, there is no point in pointing out things for improvement because you people will do at the end of the day “what you believe” in doing or “what is your own notion” of what a trade r want. You really do not care about simple logics for making things simpler, clearer and easier. I would not want to waste my time any further in giving my feedback to you guys. Thanks, any way. When I said “We believe its essential for a trader to know these margins and hence appear on the ledger” I meant that this was done considering the feedback of our clients. In zerodha Q there is no option to see the ledger with Span & Exposure margins And without the margins. This option was available at bo.zerodha.com. Is it possible to have this option in Q as well? Not in current Q. We will in the new one. Recently i could see that a particular holding of mine was not showing up in kite.zerodha .This is horrifying, what if i had to exit from that holding.It took more than few hours to get it resolved completely. Do you have a support ticket number? Recently we migrated to our own Depository, there were a few issues when this happened. I am new to zerodha and want to know how many days does Q take to show stock holding value and holding? Today I bought shares but at the end of a day it is not showing holdings. Thank you sir. It is now showing holdings. Can i know what are the exact timings for funds updation in pi/kite? ?..Your website says till 8pm..but its 9 pm now and I squared off my position in afternoon and it is still showing in margin used..why doesnt that show in total account value?? ?..Also i am unable to withdraw it..
Mayur, best to send account specific queries to [email protected]. it shows just nothing , what on earth is this. the moment i call cust support ,it starts showing ,then from second day its the same . The Exchanges conducted a mock trading session today because of which the funds weren’t updated. They have been updated subsequently. AND WHAT ABOUT THIS HOUR , WHAT TYPE OF TRADING IS GOING ON . Can you try it on a different browser/delete cache and try? We’re able to see the data at our end. Please send us a screenshot (email: [email protected]) with the system date and time, if you’re still having trouble. Exchange regulations don’t allow that. I’m new to Zerodha’s trading platform and I’m interested in performing automated SIP(systematic investment plan) for stocks. Here is what I want to do on Zerodha’s platform. Ex – On given day of a month, I want to invest(automated) a specific amount of money on to a particular stock (lets say INR 5000 on HDFC on every 12th of a month) – Is this possible and if yes, any help is appreciated. Ram, equity SIP is still not offered. We should have it up in a couple of months. Thanks Nithin. Is it not possible to use the Algo platform?… like a script that would setup a buy signal and a corresponding trade getting executed? If you want it to be completely automated, the process is quite long. Need exchange approvals and all. any updates on the Equity SIP capabilities on Zerodha’s platform? Is there any possibility of integrating my Zerodha account with mt4 platform and place my trades using mt4. I find mt4 charting and trading platform very user friendly and flexible. pl make a provision for GTC ORDERS in Commodity section. In “Q” I am not able to complete Discrepant Holdings process in Portfolio Holding. Will get someone to call and help you with this. Best to write to [email protected] for account specific queries. then it means I m At loss of Rs 1000? Yes, the value of your equity may have dropped. You’ll have to add the free cash to the equity value to arrive at the total account value. The different between the amount you’ve transferred and the total account value will be your loss. Not able to get P&L data. Report is not working properly. In holding statement , system is showing ‘N/A’ average cost on some places. Its always tough to view Reports(P&L, etc..) section in Q-backoffice. Report does not create fast and have been informed with wait for 15 minutes to create report but never displayed. Some times it creates only charges incurred during trades and never displayed with actual profit/loss made. It’s time to use technology in these basic things. We’ve made some server upgrades over the last few days, reports on Q are generating fine now. 1) While free cash is shown as 83K in q, in Kite on dashboard, the account value is shown as 0 and margin avaialble as -6 Lacs. 2) Tax P&L for 2016-17 is not coming on Q. Have already written to support about this. 1. Please check the dashboard now, we’ve made the updates. 2. I was able to generate the P&L, have gotten someone from my team to email them to you. I am having similar problem. I had called support today and was told that I have to just see the Account Value i.e 1.81 L and can still trade to utilise that 1.81. Could you kindly explain the figures? Your ledger only has the element of cash values on it. The collateral value doesn’t form part of your ledger, which is whenever you take any position, the margins get debited from your ledger, leave your cash balance in negative. In reality, your collateral also is included while we allow you to take positions. Your equity cash balance after deducting all margins from cash balance is a negative of 18,60,868.83. Since you have collaterals worth 31 lacs, your Equity balance would become -1860868.83+3149968.50 = 1289099.67 as shown in the pie chart. Margin Available is the sum of cash & collateral minus the margins used for positions taken. Account value is the value of your cash balance only. You will be able to take positions for amounts as mentioned under the ‘margin available’ column. That means, If I have got it right, I need to monitor the Account Value to determine if I need to add cash for M to M requirement. Secondly, since I have pledged Liquid Bees, I do not have to worry about the 50% cash rule. Are both the statements correct? Is there any issue with q.zerodha.com? I can see my Equity cash value as zero on home screen. Also, it says there is no open position in my account. I am trying calling support for quite sometime but it is always busy. Please help. We work half days saturdays. Can you send an email to [email protected]. How to download Pi? I have ZERODHA account and Back office password but i dont know how to download pi. i am not getting download option in back office..
i want to know how much value will i get if i liquidate my account today. how to check that since i have open F&O positions in my account. I have invested 81000/- last week through Zerodha KITE app on my mobile. It was good till yesterday. But now it’s showing no holdings in the app. Please please help me out what happened and where my money is gone. Today there was mock trading, hence maybe at that time. Can you check now. I have checked it. ZD5588 is my ID. I got my holding balance back. Please help me with the process of withdrawing money from the app. I would request you to please improve the chart function on Pi. Charts on Kite is so much better and user-friendly. I use MT4 for charting and analysis and use Pi to place orders. I pay extra to MT4. If this is not possible I request you to please provide CO with Limit order option on Kite. If you can replicate the charts as it is on MT4 or even Trade Tiger, it will be very helpful. Another option I would love to see on Pi or Kite, is using horizontal lines for entry and stop loss, in which I can move the line (stop loss) when required. How are the share allocated in the OFS (NTPC) displayed in Q -Zerodha. I dont see the NTPC shares credited and sold . I sold the NTPC shares on the very next day of the allotment. NTPC shares are not considered in the profit calculation and also not considered for 60 days challenge also. Please let me know where the profit NTPC is accounted. Waiting to see where is my profit accounted. If you go to holdings page, click on discrepant quantity, you will be able to add NTPC OFS price. ONce done, it will get fixed. What happens if a person doesn’t add in discrepancy.. Does his profit is lost ??.. or unaccounted. ..
Q is merely a reporting tool, values you add on Q have no bearing on the actual profits/losses. If you add the right values, then your reports show accurately. Thank you for the prompt reply..
Say the person doesn’t add in discrepancy. The tool doesn’t know the actual balance since some profit is not accounted. Incase I want to withdraw all the money selling all the stock.. say I want to close account.. How will person know the correct amount or how will correct amount be transferred to bank from zerodha team. If Q reports wrong number..
Do you have any other mechanisms to get correct balance ?? Ah the P&L or buy average is just an analytics layer. When you sell a stock, the value which you get by selling is what you can withdraw. Buy average calculation is only to determine the price at which you bought, doesn’t affect the value of stock you hold. How will the charges for PI will be deducted from my account. I use Pie and just want to tell you that when we open the chart first time through right click that time it shows time frame of 8 hours but after opening when we change to different time frame and again we move into 8 hour time frame that time it doesn`t show there, only 4 hours shows in the list, so for getting 8 hours chart again we have to open the chart and draw the studies there, so is there any option here to get 8 hours time frame option in a list of all time frames. Arpan, best if you write to [email protected]. I had refer some no. in Q-back office refer section, few of no`s they mentioned call back, after that there iis no any updation, just want to know shall i put more no. or not, because i have big client data with me, they just need to take the timely followup of them. Hey Arpan, sorry to hear that! Will have someone get in touch first thing tomorrow! Don’t let this put you off. I’ll make sure that this doesn’t happen in the future. I got a call from Zerodha and the executive told me that you have to put only those no. who know you and they should know that they will get a call from zerodha because we don`t call to unknown people. i told him might be few of them not interested now but they all somehow connected with market. so finally the conclusion was that – we only call to those who know you and they know they will get a call from zerodha. what i understood from whole conversation is – Zerodha dont take any initiative to approach new client untill you know them, and the whole company is running on this strategy. if a business runs like this then i dont think the company like Zerodha need to have big marketing team, client will do this himself. as i told you sir i have huge client base and i dont think it matters where did i get all clients. they know trading and they know everything about the market. so please tell me shall i put those no. in refer section or not. Arpan, would you appreciate getting calls from a business you have no idea about saying you’ve been referred by someone you don’t know? The idea with the referral programme is to let you introduce people you KNOW if they’re interested in opening an account. Cold calling people has never been the way we’ve done things. I sell my stocks that I holding demat yesterday ,but i can’t see my funds reflecting in my funds panel and in Q..
Hey Deepan. Once you sell stocks, the funds can only be withdrawn after 2 working days as delivery trades are settles on a T+2 basis. It was really good that MCX continuation chart has updated in PI, but for the changing of the time frame option is not showing there, on a daily chart we can get long term view but it would be great if in this continuation chart we could set time frame change for the intraday trading. Hey Arpan. Our data team is working on this. I am new here, currently i am very confused about my account, Please advise where we will found the total value, which i have add in my account till date. Hi. What about the UNREALISED loss/profit on option written ? Does it get settled on everyday basis or only upon squaring off ? I mean is it accounted in the equity account value on daily basis ? Hi, Im new to Zerodha. I have gone through most of the comments but it is still not clear amount ‘withdraw able balance’. When My ‘Account Balance’ will convert into ‘Withdrawable balance’ as Its been more than T+2 days post my sell of stocks and still see nothing. Can you please assist? Suddenly pledged stocks are not counted in total account value. This was not the case till last week. can you recheck and see if there is platform error ? Hey Roopa, can you please create a ticket here. I added some amount to my account and did intraday trading.made profit. Still my account value shows zero. Im not able withdraw. Whats the issue? i just want to know that is there any option in kites where when we change the time frame in daily or weekly we direct get the continuous chart instead of opening the display tab and than mark it continues chart option, if not so please consider this as a feedback. We’ll look into this, Arpan. Not sure if this is the right thread and I am having trouble finding the right one as I am new to this. I am having trouble finding download links for Pi and Zerodah trader. and which one is better. I don’t see that on the official website anywhere? Are these products discontinued?